Jungle Wild Slot by WMS - FREE Play it direct from our site now. Developed by WMS, Jungle Wild is what’s called a G+ video slot which makes it a tad special in design. This game was released in 2011 and has become a great hit for Williams Interactive. The online slot features 30 paylines and is offered with great features to make your gaming experience simply amazing. The game boasts a low minimum bet which makes it a favorite for many casino punters. The game’s object is to celebrate what jungle life has to offer while enabling you to win some money while at it. To this end, Jungle Wild focuses on plants, insects and birds. On the reels, you will see colorful symbols including butterflies, flower varieties, parrots, pyramids, gold idols, monkeys and a horde of other jungle related symbols. Deep within the jungle, there are precious treasures that you should find to get your credits pumping. It is up to you to follow the clues provided to unlock secrets that will find you untold wealth. There are great looking flowers, insects and birds to make the general design of this online slot inspiring. Another pokie to try along the same theme is the Queen of the Wild pokie. You can bet a minimum of 0.25 coins and a maximum of 75 coins. Coin denominations run from 0.01 to 3.00 and you can only bet a maximum of 25 credits. You can win a standard jackpot of 7,500 coins by hitting five Jungle Wild Logo symbols. On the gaming screen at the bottom, you will see a “help/pays” button from where you can read game rules, paytables and anything else that relates to this game. 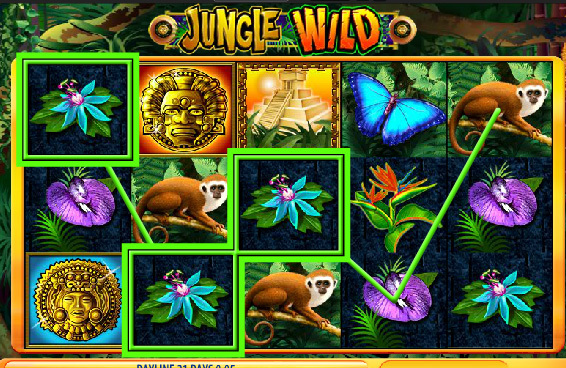 The Jungle Wild Logo serves as a wild symbol with this online slot. The symbol can thus replace other symbols in the game (except the scattered pyramids) to complete winning combos. The wild symbol also gives you the highest payout. You can also win a total of 750x your stake by landing 5 Blue masks or 5 Red masks. Other symbols pay less; between 100 coins and 500 coins for landing five of a kind. The pyramid symbol is scattered. Landing 3, 4 or 5 scatters anywhere on the reels awards you 5, 7 or 20 free spins respectively. Though there are no multipliers for the free spins, you will be offered two random wild reels for every free spin. If you place the Jungle Wild Logo and the wild reels in the right locations, you can win up to 10,000 coins. This online slot offers you a gamble feature which enables you to multiply your wins. This feature only becomes active after a win. It is a simple feature where you will be prompted to pick the colour of a card (black or red) in a deck of cards. Correct guess doubles your wins. You can double you wins for up to 5 times or until you hit the 5,000 gamble limit. This online slot also offers a Jackpot Party Bonus which can be triggered independently from game symbols; this bonus is random in nature. 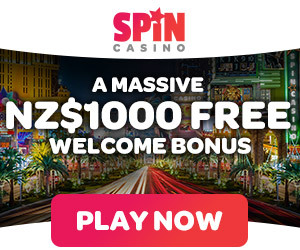 The bonus allows you to collect stars that award some big progressive pokies jackpots. We rate this WMS free online slot a solid 7 from 10. It’s graphics are colourfull but a bit messy to the eye but don’t let that worry you as overall it is a good pokies machine to have a burl on.